When we turn on a faucet connected to a hose with a small nozzle at its other end, we know from experience that we have to keep the hose in hand, otherwise we will likely get soaked chasing down the runaway end. What happens is that the water pressure, as it passes through the nozzle, transforms our ordinarily tame garden hose into the equivalent of a tethered rocket. With this picture in mind, can you also see that when we are angry or anxious, the same principle holds true in us, as it does in the hose example, of too much pressure and too little release? Heated thoughts or runaway emotions flood through our psychic system, pick us up, and cause us to careen wildly until we crash into whatever unfortunate thing may be in our path. Now, when it comes to our chores, and the hose runs wild, we can either turn off the water or simply widen the spray of the nozzle and our problem is solved. But when our constricted consciousness reaches critical mass and starts throwing us around, how do we resolve this pressure? It should be clear by now that our usual approach to venting this pressure provides, at best, only temporary relief. What we really need isn't a Band-Aid, but an inner healing. This need brings us, once again, and yet in still another way, to the time-honored truth of "Know thyself." Only the understanding of our actual inner condition shows us what can free us, otherwise we wind up the servant of our own inner pressure, doing what it bids us do instead of being its master. Commanding the pressures of this life begins with understanding that the stress we feel is first an inside job. In and of itself, there is no such thing as a "pressurized" moment. Try to see the truth of this. The present moment flows along freely. Nothing can possibly restrict what is ever refreshing itself in the ever-new Now. This finding reveals that any pressure we come to feel in any given moment is the unhappy effect of some hidden agent within us acting on the ordinarily free-flowing content of each of these moments. In no time at all, the quiet and naturally unrestricted stream of events around us becomes a jet engine within us, rocketing us out of peace. Now, in our physical world, whenever the garden hose gets "charged" and starts to whip around, we simply realize what has happened, reach down, and turn off the water. But in the spiritual world within us, we can't "turn off" life! It pours itself out in an eternal outflow, which brings us to an important question. If it is not the movement of life itself that restricts us, where then is the hidden bottleneck wrecking our inner world? There can only be one answer to this timeless question, although it may be stated in different ways. It is our own narrow mind, with its narrow view of life, that pressurizes our events and their moments. This small mind, which can't be separated from the narrow world it perceives, tends to see life's events not as they are, but as what they are not according to its own unconscious demands. In other words, the punishing pressure we feel in this life is not because of what life is but because of what we perceive life isn't -- a judgment that could neither be reached nor sustained were it not for there being within us an unseen "board of governors" that had already concluded what "best" serves us and what won't. But see the contradiction in this discovery and you will free yourself of the pressure created in its undetected presence. Whenever you "serve" this painful pressure within you, to somehow release yourself from it by doing the dance it prescribes, it is not your interests you serve, but the hidden interests of some small self -- the one that has been "telling" you all along what your real pleasures are by punishing you when they seem out of reach! The next time some pressure starts to build within you, learn to use it to shake yourself awake. Rouse yourself to the pure fact that whatever stress you are starting to feel doesn't really belong to you. Stand back from yourself long enough to see that pressurized thoughts and feelings can only arise from a narrow view of life that belongs to a narrow self -- a false self that you had momentarily and mistakenly taken as your own. Then just quietly drop this formerly unconscious conclusion. This same moment of letting go releases you from this restricted sense of self and the narrow life it creates. 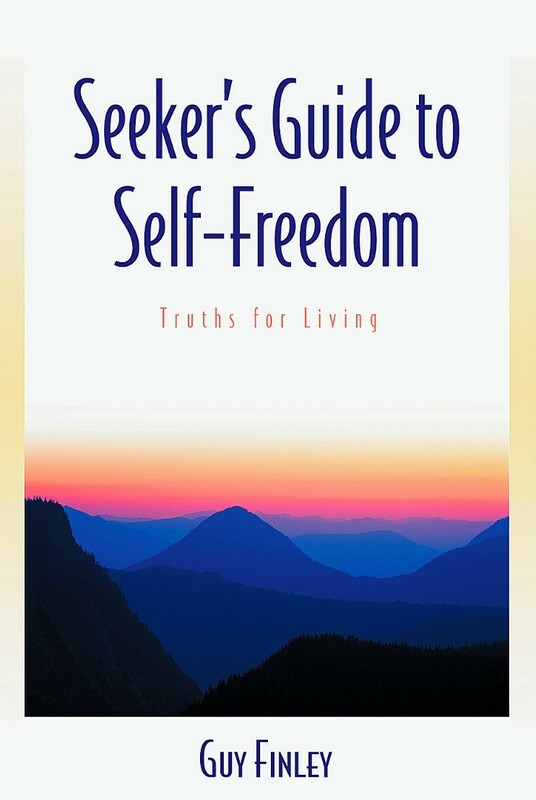 Excerpted From: Seeker's Guide to Self-Freedom: Truths for Living, pages 28-30.